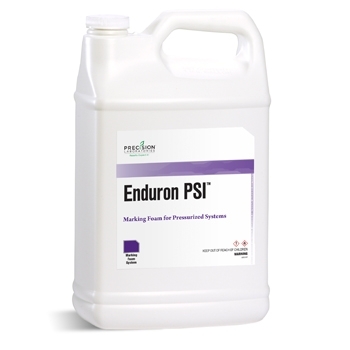 Enduron PSI is formulated to maximize marking foam performance in pressurized marker systems. It generates greater volumes of heat stable marking foam under a wider range of operating pressures. Enduron's high expansion formulation produces large volumes of thick, long-lasting foam that allows applicators to drop more foam at higher operating pressures and application speeds. In side-by-side field tests, Enduron PSI has outlasted competitive marking foams by over twice as long. 13 ounces per 10 gallons of water.